The old saying, what you don’t know can’t hurt you, is not only false, it’s dangerous. What you don’t know about buying a car, even from a car dealer you trust completely, CAN hurt you, sometimes by thousands of dollars. The purpose of this article is to save you from having a buying experience like the one I just had with Sunset Ford near St. Louis, Missouri. They lured me in on a pretext, and then sold me a car based on a misrepresentation. Later, when I confronted the sales manager and salesman with proof, they refused to correct the issue. The more you know about the car you are trading in and the car you want to buy, the better off you will be. While this isn’t rocket science, it is complicated; so if you are averse to numbers, financial negotiations, and standing your ground, bring a friend who is comfortable with all three. Sounds ideal to those of us who put a premium on ethics but, sadly, it doesn’t always hold up in the real world. The misrepresentation mentioned in my opening paragraph? Sunset Ford omitted several of my trade-in-car’s features when they looked it up on the Kelly Blue Book site (KBB.com). When they quoted me a much lower value for the “Very Good” condition than I had found earlier, using the same website, I questioned it. The salesman insisted their finding was correct and convinced me that I had made a mistake. As it turns out, I had not made a mistake. When I came back later with proof, they refused to make good on their “error.” Instead, they began a series of rationalizations for their refusal to adjust our deal to compensate for the mistake. These I will explain later under Definition of Fair. The pretext I referred to was a mailing that contained a copy of a purported email from the owner of Sunset Ford to the sales manager, saying that he had a buyer for my car. Attached was a “handwritten” Post-it®note from the sales manager asking me to call. What makes me think that email was a fake? a. The postmark was from California, with no return address (I live down the road from the dealership, located in Sunset Hills, Missouri). c. An Auto News article2 describes that mailing strategy nearly identically, down to the hand-written mailing address. Your dealership may put its best face forward, but the pervasive attitude could still be “Buyer Beware.” In addition to the tactics I have already mentioned, here are a couple of more to look out for. The salesman claimed the trade-in value of my car was not as much as I had found earlier on KBB, and they could not even SELL it for that amount, much less pay that much for it. When I later brought in my KBB screen shot, showing that I had been correct on the valuation, he morphed the story, saying KBB is only a guideline. In fact, he continually insisted they sold “the twin” to my car the day before and would not be able to get more for mine than about $16,500. When I dug deeper into KBB’s used-car listings, I found that there was not another car within two hundred miles with a similar low mileage and the same set of features as my trade-in. This makes me highly suspicious of “the twin-car” story. For me, the final straw was the sales price. Sunset listed my car at $20,185 on its used car lot—nearly $4,000 more than the supposed resell value my salesman claimed. a. They automatically go by KBB’s “Fair” condition, no matter what shape the car is actually in. b. It takes a lot of money to get a car ready for sale, and they have to adjust for that. c. KBB is only a guideline. b. The money required to get a car ready for sale is already factored into the KBB value. c. If KBB is only a guideline, why do dealerships advertise trade-in allowances according to KBB values? Case in point: The “email” stated “up to 110 percent of KBB value” for my car. Phrases like “up to 110 percent of KBB” do not necessarily mean what you think they do. Let’s break it down. a. “Up to”—Reading the above makes you think, barring some kind of bizarre circumstances, they need/want the car so badly that the people on the sales floor are authorized to give more than the actual trade-in value as a bonus. In fact, the phrase “up to” opens the door for lower valuations for whatever reasons the dealership feels will fly. b. “110 percent of KBB”—What could be easier, right? Agree on a KBB condition, look it up, and multiply by 1.1. In my situation, when I brought in the correctly configured KBB report, they decreased the car’s condition, which put it into a lower trade-in range. If I’d come in as a looming, six-foot-something, desk-pounding male, would it have made a difference? In this case, I honestly do not know. I believe my salesman is basically honest but was put in a tough position by the sales manager and the dealership’s co-owner, who failed to make a personal appearance when I came back in to discuss the trade-in value discrepancy. Instead, they sent the salesman as the messenger, even after I was obviously enraged over how I was being treated, and he was visibly flustered. They even let me leave knowing that I was still angry. Perhaps management would have taken my concerns seriously if I were a man. According to the Nolo legal organization4, “Women often get ignored, patronized, or just plain ripped off at car dealerships.” There is a lot of good car research and negotiating advice in the Nolo article. It would be useful for you to read it before going car shopping. Unfortunately, I did not read the article beforehand. Forgetting all the reasons I hate buying a car and thinking I was walking into a truly friendly environment, my demeanor during my initial visit was “Roly-Poly Grandma.” There was no reason to be unpleasant or stern, right? WRONG! Sadly, I have since had to dredge up a past persona, “Pit Bull Marketing Executive.” I probably could have saved a lot of trouble for myself by taking that attitude from the beginning. Before going into a dealership, research both your trade-in and the car you intend to purchase. 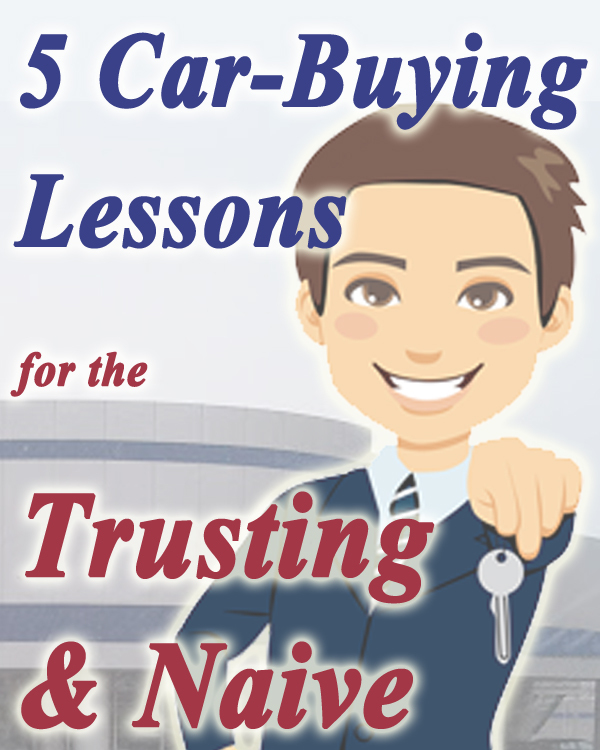 Regarding trade-ins, the prevailing advice from experts is to sell your car privately. You will get more money for it. On the other hand, that route also requires more effort on your part, so your choice depends on your situation. i. First, taking the condition quiz5. ii. Then, getting your blue book value by completing the steps on KBB6. b. Get an idea for the range you can expect to pay for the car you are interested in purchasing in the Price Your Next Car section on KBB7. Consumer Reports is another very valuable resource. It was “formed as an independent, nonprofit organization in 1936 … [that] serves consumers through unbiased product testing and ratings, research, journalism, public education, and advocacy.” As part of that mission, it offers car-value reports and a purchasing service. a. The Car Pricing Service8 tells you the sticker price (MSRP), what the dealer paid (including current incentives from the car maker), what people pay on average in your area, and the rock-bottom price you can expect to pay. It’s all laid out line by line in black and white so that you will be able to adjust values for specific cars with different features. b. The Build and Buy Car Buying Service9 takes pricing a step further by helping you acquire savings from local dealers. After configuring your car on the Consumer Reports website and providing your contact information, you receive a savings certificate from each participating dealer, along with salesperson-contact information. Just as in the car-price report, you will see every step in how each dealership arrived at its price. As you complete your research, print out all reports, and bring them with you when you shop for a car. This was my biggest mistake; instead, I believed that my dealer was truthful about looking up my trade-in value correctly and that I had made a mistake. If I hadn’t trusted them, events would have unfolded VERY differently. Consequently, I love my car but hate my dealership. Armed with indisputable facts, YOU will not make the same mistakes I have made. If you get any push-back about the validity of the data you present, WALK AWAY. Other dealerships have the same car. Also,if you used the Car Buying Service and the dealership refuses to honor the savings without a valid explanation, report the dealer to Consumer Reports. Valid, verifiable explanations could include (a) what they have on hand has different options from what’s on your certificate, or (b) the incentives have expired (expirations are printed on the certificate). Using the certificate to get you onto the premises, then refusing to lower the price based on legal loopholes is not, in my opinion, an ethically valid reason. In my mind, fairness and the willingness to correct errors go hand in hand. For others, the agenda is re-spinning history and rationalizing the way things turned out. Even though both the salesman and senior sales manager expressed concern over my anger, all Sunset really seemed to care about was selling me a new car. When it was all over, I told my salesman that I loved the car. “That’s all that matters,” he replied. I let it drop, but my feeling about that, if you haven’t guessed, is an emphatic NO! Ethics matter just as much. The dealership had chosen to focus on a specific piece of the entire scenario—where $1,100 falls on the financial statements—and labels it a “miscommunication.” (You can read the review through this link10 if you want more detail about what I see as evidence that miscommunication was not the problem). Financially, that piece of the puzzle is irrelevant to my point. My point is that—by leaving some features out of the description of my car, downgrading the supposed condition of my trade in, and manipulating the numbers—the dealership cost me $1,180 or $1,798 (depending upon which agreement we base our calculations). This was an expensive lesson. To avoid something similar happening to you, take copious notes and have the salesperson validate what you’ve written. You may even want to bring an audio recorder to put on the desk between you and dealership personnel. If they have any issues with that, leave. I can think of no good reason an above-board seller would object. The bottom line is, where you spend your money is YOUR choice. Be informed. Be emphatic. And take your business to a dealership that is aligned with your personal values. After 30 years in the nonprofit field I decided I needed a little change in life. So just this week I started a job as a salesperson at an auto dealership. I love cars and trucks…..so I am hoping to combine my desire to help people and my passion for automobiles to make a decent income and have some fun. My top priority is to treat people right and I sure hope the dealership I now work for has the same definition of this concept as mine. Your blog post here was a good read. I will carry your experience in my heart and use it to guide my actions. Wonderful, Susan. I believe dealerships need to make a profit, but deception and lies aren’t the way to go about it!